There IS a Cure for Smoking. It's Called Vaping. 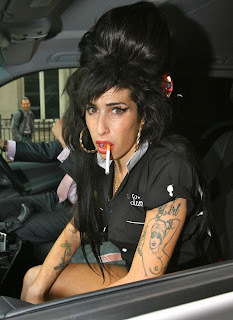 I absolutely loathe the song “Rehab” by Amy Winehouse. The fact is that if the fabulously talented singer had actually gone to rehab, she might still be alive. Instead, Amy died at age 27 of alcohol poisoning with a blood alcohol level of .416 – five times the legal driving limit. there IS a cure for her disease. There was a cure for her tragic and premature death. It was called rehab. There are lots of scary diseases out there that can take us well before our time, and even in our prime. But unlike some forms of cancer and horrendous diseases like leukemia where the diagnosis is an early death sentence, there IS a cure for diseases like alcoholism. It requires the alcoholic to acknowledge that she is powerless over alcohol, change her thinking and her habits and stop drinking. Completely. Everyone knows that smoking cigarettes causes early death from lung and oral cancers, heart diseases, strokes, and a host of other issues. Women who smoke during or after pregnancy also put their fetus and infant at risk of premature birth and Sudden Infant Death Syndrome (SIDS). including still birth, miscarriage, and premature birth. All told, cigarette smoking and secondhand smoke cause more than 440,000 deaths each year in the U.S., making it the leading cause of premature, preventable death in this country. There IS a cure for this as well, and it’s called quitting. But a recent Gallup poll has found that the vast majority (85 percent) of smokers have tried to quit at least once, and many of them (45 percent) have tried to quit at least three times. 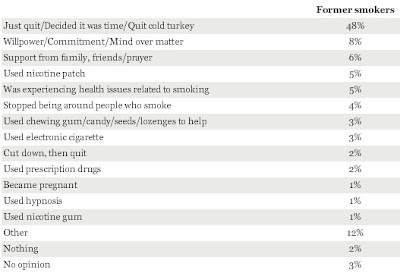 Most Americans who successfully quit smoking quit "cold turkey." To a much lesser degree, they named willpower, support from family and friends, the nicotine patch, not being around people who smoke, and chewing gum or eating candy. In this latest poll, the use of an electronic cigarette also made the list. 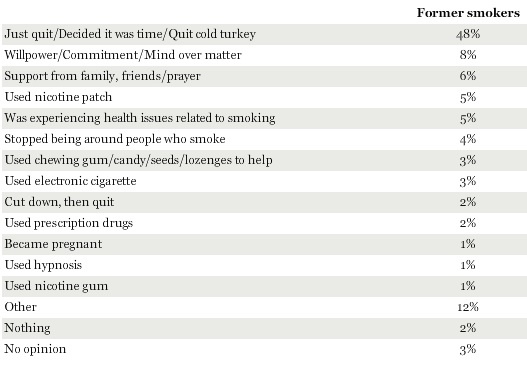 What strategies or methods of quitting were the most effective for you? Reformed smokers cited their health, including pregnancy, bronchitis and cancer, as the leading reason for quitting. Fewer former smokers say they quit because of the expense, but they the fact is that smoking has become a lot more expensive with recent increases in cigarette taxes. One interesting finding in the survey is the fact that the number of smokers who think they are really “addicted” to cigarettes has gone up in the last 22 years – from 61 percent to 72 percent. Yet studies have found that the earlier figure is more accurate: only about 60 percent of smokers are truly addicted to nicotine, according to the National Survey on Drug Use. That’s good news for women who are simply social smokers – who like to smoke when drinking, or who smoke occasionally as a guilty pleasure or for nicotine’s feel-good effects. It means you may not be addicted to nicotine, but simply to the habit of smoking. Regardless of how much you smoke – one cigarette a day or one pack a day on average – or if you’re actually addicted to nicotine, smoking puts you at risk of horrible but avoidable diseases and premature death. 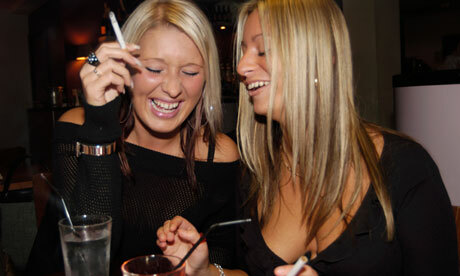 Most women who are social smokers are NOT physically addicted to nicotine. They're addicted to the habit and nicotine's feel-good effects. So instead of digging in your heels like Amy and saying, “I don’t want to go to rehab,” or “I don’t want to give up cigarettes,” get into a whole new mindset. Tell yourself that you can quit. And if you don’t want to quit cold turkey, try switching to an e-cigarette with no nicotine, or one with a low level of nicotine if you think you may need the nicotine. Pretty soon, you’ll be singing a wholly different tune.